Flawed and flamboyant, the charismatic Jesse Jackson wasn't the perfect candidate, but his idealism led The Nation to endorse his bid for the White House. 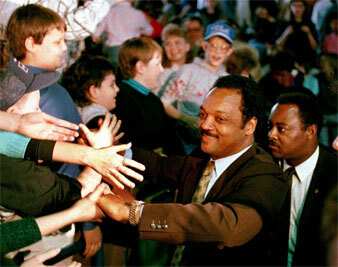 Jesse Jackson shakes hands with supporters during a campaign stop in this Feb. 26, 1988 photo in Hazard, Ky. The Nation‘s editors believed the Jackson campaign was woven around a dream whose realization would bring into Washington such doers and dreamers as had not been seen in decades. Jesse Jackson is a serious candidate for the presidency. He was always serious; it was just the press, the political scientists and the other politicians who belittled his campaign, trivialized his efforts and disdained his prospects. Despite the contempt and condescension of the media–or perhaps because of it–Jackson went to the most remote and isolated grass roots in the American social landscape to find the strength for a campaign that has already begun to transform politics. For five years his distance from the funders, the managers, the mediators and the consultants who manipulate the Democratic Party and legitimize its candidates has allowed Jackson to do unimaginable things and say unspeakable words–about race, about class, about equality and, indeed, about democracy. To an extent that may be unique in presidential elections in this century, he derives his power from the people. The enormous energy that his campaign releases has created a new populist moment, over taking the languid hours and dull days of conventional politics and imagining possibilities for substantial change beyond the usual incremental transactions of the two-party system. It offers hope against cynicism, power against prejudice and solidarity against division. It is the specific antithesis to Reaganism and reaction, which, with the shameful acquiescence of the Democratic center, have held America in their thrall for most of this decade and which must now be defeated. For that reason, The Nation is endorsing Jesse Jackson for the Democratic nomination for President. The Jackson campaign is not a single shot at higher office by an- already elevated politician. Rather, it is a continuing, expanding, open-ended project to organize a movement for the political empowerment of all those who participate. In the beginning, Jackson identified his basic constituency as the most “dispossessed and disaffected” Americans of all, the blacks of the rural South and the Northern ghettos, people who seemed permanently disenfranchised from citizenship and thus denied entrance into the system of rewards and privileges that is every citizen’s right. In, a real sense, the campaign became a new civil rights movement with an added dimension of economic justice deriving in spirit from the last campaigns of Martin Luther King Jr. with the black working poor. “We work every day,” he reminds the crowds, which invariably respond with knowing assent. “And we are still poor. We pick up your garbage; we work every day. We drive your cars, we take care of your children, we empty your bedpans, we sweep your apartments; we work every day. We cook your food, and we don’t have time to cook our own. We change your hospital beds and wipe your fevered brow, and we can’t afford to lie in that bed when we get sick. We work every day.” He does not merely see the poor as victims; he calls them to struggle for their rights. To include would-be followers in his new movement Jackson made a simple demand: that they register and vote. They responded with groundbreaking enthusiasm. Millions of people who won the vote in the great civil rights efforts of the early 1960s exercised that right for the first time two decades later. The success of Jackson’s long march through the cotton counties and ramshackle slums of America was evident before his current campaign commenced, and in ways outside the realm of presidential elections. The “new voters” he inspired joined with millions more, motivated by the stirrings of populist potential on many fronts, and helped break the conservative stranglehold on the Senate in 1986. More than that, young black-and white-activists from the new movement challenged the legitimacy of cynical and sometimes corrupt leaders who for years had dominated racial and ethnic politics on the local level. Jackson felt compelled to deal with many of the anachronistic demagogues, ward bosses and machines that were in place in his field of operations. He had not yet built an independent force strong enough to present a credible alternative, and his 1984 campaign suffered from that weakness. The pool of available, authentic leaders who shared his vision was smaller then, and he chose some who did his project discredit. His perplexing association with the charismatic but divisive Nation of Islam firebrand Louis Farrakhan can be seen more clearly now in terms of the contradiction it expressed: the tactical acceptance of a powerful rival who had considerable authority over the hearts and minds of the very people Jackson meant to organize. It is no longer necessary for Jackson to make such bad deals, if it ever was. His successful resolution of those earlier problems, by building his base and expanding his horizons, shows a skill and a sophistication that makes a powerful case for his candidacy. In Mississippi, in Vermont, in Maryland, in Michigan, California, Texas and across his sphere of operations a new breed of progressive leadership has penetrated and in some cases replaced the old power structures. In Detroit, the successful campaign is poised at Mayor Coleman Young’s door. And not only in elective office: The campaign has already begun to have important consequences for restructuring leadership of work, social and religious institutions at the base-in labor locals, church groups, community organizations and academic associations. As the Rainbow Coalition reaches beyond its primary constituency to include an array of new ones, the values espoused are incorporated into the growing movement. When unionists, feminists, Hispanics, Asian-Americans, students, civil libertarians and community activists join or endorse the Rainbow campaign, they contribute their ideals and their energies while they share the coalition’s strength. And in the end, it is their participation that catches Jackson’s attention and insures the campaign’s integrity. Jackson has struggled to legitimize his own leadership above the Old Guard, and he is strong enough now to transcend most of the regressive elements and see the parts of his coalition actually coalescing in practice as well as theory. The results are startling. Farmers from Iowa campaign in black Chicago, white ethnic hardhats and young gays and lesbians work together in northern Wisconsin, genteel peace activists and black hip-hoppers leaflet in the projects of Hartford. The culture of American polities is being radically reformed. The shape and substance of the Jackson campaign–in the long version–is essential to an understanding of his candidacy. For one thing, they offer evidence of Jackson’s extraordinary conceptual powers and political skills and constitute just the kind of “experience” a President should have to organize the country around a transformative agenda. The argument that Jackson is unqualified for high office because he has never held one is bogus on its face. A modern President–or a postmodern one–is not primarily a business executive or even an engineer of a sterile consensus. There are plenty of managers, budgeters, policy analysts and public relations specialists who would love such jobs and can be hired to perform them. A seat in the Senate or an office in the statehouse has undoubted advantages in the’ electoral game, but neither has much to do with being President of the United States. A President who would bring real change must organize a social movement to do it, must recast the culture, must institutionalize a vision in politics from the grass roots to the halls of power. Building a coalition “on the ground” is one thing; using it as a model for an Administration that would redistribute power, reorder priorities and extend democracy is another. The Jackson campaign is woven around a dream whose realization would bring into Washington such doers and dreamers as have not been seen since the first age of Jackson in the infancy of America. They propose to shift the direction of foreign policy from its costly and dangerous obsession with cold war relationships in a bipolar world to a new partnership with the dispossessed and disenfranchised. In this vision, Third World countries would no longer be appraised as mere bases to be contested and their populations as markets to be exploited, but as organic components of an economic and political order in which development and independence take precedence over profits and the paranoia of empire. Jackson’s shorthand on the stump for the new economic system he envisions is, “Stop jobs from going out.” What that entails is exceedingly complex. For starters, it involves the C.I.A. and its old assets in labor ceasing to manipulate foreign trade unions; U.S. corporations and transnationals curtailing their most exploitative practices and redirecting the profits from their foreign operations to the development of independent local economies; and a change in monetary policies and debt management in this country to end the economic enslavement of America’s clients. At home, Jackson vows to end the “economic violence” evidenced everywhere–in the ravaged cities and crumbling factories and deserted farms, the homeless and the overcrowded and the underpaid, the uneducated and the sick and the alienated. Despite the blather of the social theorists, those conditions and those people did not just happen; they are the grist of a specific economic order that is supported up and down the line by government policy. Jackson’s campaign proposes to confront corporate power with the challenge of populist power, something that sets him apart from the other candidates, who are still reeling from the corporate counterattack in full force since the early 1970s. He has consistently urged real tax reform to reverse the regressive Reagan legislation (passed with many Democratic votes) and, beyond that, to begin a program to redistribute wealth and power from the corporate class to the consuming and working class, on a magnitude that has eluded even the best-intentioned liberals since the New Deal. Electing Jesse Jackson means endorsing an increase in the minimum wage; measures to end gender pay inequities and reward work on the basis of “comparable worth;” an attempt to reverse the systematic destruction of family farms by corporate agribusiness; Federal action to halt factory flight, of both the offshore and Sun Belt varieties, and ameliorate its consequences among workers and theft communities. Jackson’s Justice Department, free at last of the Meese curse, could begin to enforce and extend antitrust laws to deal with mergers, takeovers and acquisitions and their baleful effect on economic growth and employment. In time, under such a presidency, the war economy that has defined the American Century for fifty years might begin to give way to a peace economy. Jackson’s first step, and one that could be taken quickly, would be to freeze the defense budget, beginning to weaken apace the ideology of militarism that it has produced. The high-tech hardware firms that bankroll so many political campaigns–Democratic as well as Republican–would have to find new ways to invest their surplus capital. More ambitious still, substantial new investment in education, housing, transportation, community services and infrastructure would lay the foundation for a full-employment society, promised and postponed by Democrats since the end of World War II. Jackson asks that the national education budget be doubled. He proposes job training (and retraining) and a national child-care program to help people stay off welfare. And he seeks a complete revision of the social welfare system as a concept: assistance to the needy not as a necessary evil or noblesse oblige but as a matter of human rights. Finally, alone among presidential candidates now or in the past, Jackson proposes a national health-care plan that would end America’s disgraceful attitude toward its sick and make preventive medicine and long-term treatment universally available. All of Jackson’s critics ask, How would you pay for it? He would annually save $60 billion by 1993 from a freeze in defense spending, $20 billion by restoring the maximum personal income tax rate to 38.5 percent (affecting the wealthiest 600,000 Americans) and $20 billion by returning corporate taxes to near their 1970 levels. The campaign has drawn up impressive budgets, and Jackson is offering ingenious new ways of liberating capital for public use, such as the investment of pension funds in federally approved projects. But the budget crunch that has deadlocked social development in America for a generation cannot be approached by limiting the range of possibilities to existing categories of revenue. Look at the wealth of America, weigh its resources, feel its power. There’s enough money in this country to do everything Jackson asks, and more. The neoliberal formula manipulates available resources within the existing orders of priority; the progressive vision articulated by Jackson points to the country’s vast wealth, and the waste of so much on militarism and imperial adventure. On one side lie the values of the market and the counsel of despair; on the other, the values of citizenship and the sense of possibilities. But are we only dreaming? Jackson is leading a movement for reform, not a revolution, and he would occupy the presidency as a radical reformer atop an essentially liberal consensus with powerful–extremely powerful–conservative forces battering at the gates. Even in the best of situations, he does not have the means or power to hold the whole country in his hands. Washington’s permanent government, which wakens all dreamers in the White House after their first night’s sleep, would do its best to dash the fondest hopes of real reform. The ability of the Chief Executive to act decisively remains immense, however; With a virtual stroke of the pen, Jackson could put an end to covert action, for example, or institute a nuclear test ban or restore diplomatic relations with Cuba. He could reinvigorate the Civil Rights Commission, feminize family policy departments and end discrimination against gays and lesbians in Federal employment. The change in the political center of gravity that would make possible his election, plus the powers of the presidency, the arrival of new leaders in Congress and the city halls and state legislatures would give Jackson important strength to withstand an inevitable counteroffensive by the military and intelligence communities, the private banks, corporations and multilateral financial institutions-even, perhaps, a recalcitrant Democratic Congress. It is impossible to foresee the final outcome of these conflicts. There would be wounding skirmishes and bloody battles, retreats and compromises, but all in the direction of the sweeping visions that inspirit the movement. The ideals set forth in this campaign are important in themselves, apart from their enactment in a land under a far-off Rainbow. They should stand as a new agenda for progressive America, a yardstick against which all others must be measured. For, after all, it is this set of values and the campaign that has formed around them that are of historic importance to America; they must outlast even the best leaders who espouse them. The campaign contains the dream, which will not die with defeat or delay. It already has strongly influenced the other Democratic candidates, who have appropriated not only the themes but in many cases the images and the words Jackson has long been using. If winning the presidency isn’t the only thing valuable about this interminable campaign, Jackson has already won something: He has set the tone and the terms of debate beyond anyone’s predictions. Whatever happens in the big-state primaries still to come, Jackson cannot be counted the “frontrunner” for the nomination, because the rich and powerful in the Democratic party fear not only his program but his prospects for election, and will do everything they can to stop him. Now, that the euphoria of his Michigan landslide has been curtailed by three straight losses (Connecticut, Colorado and Wisconsin), the heat on him may abate. That old bugbear “electability” needs to be confronted head-on. By running and winning, Jackson has demonstrated that he is as electable as any candidate need be to get the nomination. The impetus and euphoria of his campaign in recent weeks lie in its ability, demonstrated repeatedly, to reach beyond the core that explicitly shares Jackson’s ideological frame. There is evidence in the primaries of a broadening audience responding to the restoration of a politics that has profound roots in the American heartland; there is also a recognition that Jackson’s candidacy does not emerge from nowhere but rather lies squarely within a tradition extending from the earliest part of nineteenth-century Democratic revivalism through Midwestern Populism, the labor wars, the New Deal and the civil rights movement. At the end of the day, it may yet be that racism and conservatism, and Democratic defections, doom Jackson to defeat. There is that risk. There is always that risk, but both principle and a sudden, pragmatic sense of what may be possible dictate that the risk on this occasion is acceptable, not foolhardy. There are worse things in the world than losing. And anyway, moving closer to the Republicans in order to stave off a Democratic defeat yields not only a bad candidate but a low-energy campaign. The means to victory is in energizing the voters, offering real change and expanding and recapturing the party’s base. In that respect, Jackson has already won more than anyone had hoped, and the longer and stronger his campaign continues, the more he can make over the political face of America. Jackson is not the perfect candidate; many of us at this magazine see serious flaws in the man. The flamboyant manner, the flair for grandstand gestures and the evident temper and ego must all be calculated in any assessment of his candidacy. Questions remain about his past–his behavior in the aftermath of the assassination of Martin Luther King Jr., his careless financial management of the PUSH operation in Chicago and the provenance of some of its funding (which might eventually be raised against him). Nor has the intensely emotional issue of Jackson’s relations with American Jews been resolved. Despite several heartfelt apologies–including one on the rostrum of the Democratic National Convention in San Francisco–he has not won the forgiveness of the organized Jewish community and many individuals for his insensitive “Hymietown” remark or his embrace of Farrakhan in 1984. Many Jews also fear his support for Palestinian self-determination and his willingness to talk to their chosen representative, the Palestine Liberation Organization. The first were serious errors, but the last is a matter of principle for Jackson, and he has no reason to apologize for it. Indeed, the mainstream of American politics–George Shultz, Jimmy Carter, even Richard Nixon–has caught up with his courageous recognition that the Palestinians must be dealt with directly. He may have had vestigial attitudes of prejudice that are rooted in American culture, but they are unlike the virulent racism that characterizes the present Administration in Washington, and he seeks to transcend them. Jackson’s roots in the rural, religious South and his distance from the development of contemporary movements of sexual liberation and personal autonomy also pose problems which must be overcome. He has made stopping drug use and teen-age pregnancy central issues in his campaign–for very good reasons–and he has never associated himself with a strong feminist position on abortion, for not-so-good ones. Too often Jackson’s attacks on social evils sound moralistic and condemnatory, suggesting the preacher’s sermon rather than the radical reformer’s demands. But only candidate Jackson marched with lesbians and gays in Washington last October. He asks for women to become an institutionalized segment of the Rainbow, and he consistently looks at the economic basis of women’s oppression. On balance, we believe the importance of a black candidacy for President and a progressive movement for change in America overshadows any deficiencies in Jackson’s résumé and the faults in his campaign. Racism may be as American as cherry pie, but it is a poisonous portion that fouls every dream and deforms every vision. It might have been that a candidate from the racial majority would lead a campaign to defeat racism, but that did not happen. History has come up with another and more fitting scenario: A candidate from the most oppressed minority will organize a national coalition to accomplish that end. In March, Texas Agriculture Commissioner Jim Rightower brought Jesse Jackson into the Senate Chamber of the State Capitol for his endorsement announcement. At the time, Hightower was the only white, elected state official in America publicly to support the black candidate. Under a portrait of Jefferson Davis, flanked by full-length paintings of Lyndon Johnson and Barbta Jordan, Hightower read a short speech that caught the historic meaning-and illustrated the essential ironies-of this extraordinary year. For us at The Nation, too, the Jackson campaign now embodies what we believe is necessary and just for America, and we are proud to stand with it. With hardly a backward–or forward–look, the bulk of the surviving American left has blithely joined the Democratic Party center, without the will to inflect debate, the influence to inform policy or the leverage to share power. The capitulation of the left–a necessarily catchall word, here covering the spectrum of progressive politics from old socialism to recent radical activism–is almost without precedent. This time out there is no McCarthy of 1968, no McGovern of 1972, no Kennedy of 1980; not even a John Anderson or a Barry Commoner to raise a standard of dissent or develop an alternative vision against a Democratic Party whose project is overwhelmingly conservative in attitude and action. The excuse for submission is easy to discern: Anybody But Reagan. But the consequences are likely to be dire, and they are already taking shape. By accepting the premises and practices of party unity, the left has negated the reasons for its own existence. In the beginning, of course, there was a certain Somebody within the Democratic fold who was a candidate not only of principle but of opportunity of the left. Jesse Jackson, and the Rainbow Coalition he proposed, represented the historical base, the organized movement and the radical program for which the left has been hunting the last thirty-five years. But…no. Jackson is usually taunted for failing to broaden his coalition, but when he made personal pitches to each likely constituency, the invitees almost invariably declined. Jackson gave an impassioned call for the solidarity of racial and sexual movements last October in the keynote speech at the gay Human Rights Campaign banquet at the Waldorf-Astoria; by March, gays were openly supporting Hart in the New York primary and Mondale in other states. Jackson talks to unionists and women, and last November 12 he addressed marchers who had come to Washington to demonstrate against US intervention in Central America. But sympathy to his overtures rarely led to organized support. Barry Commoner urged the Citizens Party to endorse Jackson–if there was ever a natural white base for Jackson, it was there–but the party is putting up its own candidate, leaving a lonely Commoner to enter the Rainbow unattended. Long before Louis Farrakhan slouched into the headlines, white leftists had run through every excuse to withhold support from the black candidate. First there was the argument that only a respectable black with a significant white following should be allowed to swim in the Democratic mainstream. Then there was the notion that any black candidacy would provoke a backlash from white voters. Next came charges that Jackson was, in turn, a charlatan, a crook, an anti-Semite, a capitalist roader, a poor administrator, a divisive force. Quickly the dark motif of Campaign ’84 changed from Anybody But Reagan to Anybody But Jackson. Once again, racism destroyed the promise of a populist, progressive, internationalist coalition within the Democratic Party. As had to happen, Anybody became Walter Mondale, and he arrived promoting a platform as immoderate and regressive as any to be found in the Democratic Party archives since John W. Davis’s unremembered candidacy of 1924. With substantive objections only from Jackson’s underrepresented contingent, the party’s pre-convention committees adopted policies and accepted planks that contained the essential elements of Reaganism: continued military expansion, support for Reagan’s allies in Central America, the Caribbean and the Middle East, further degradation of the welfare system, denial of black demands for equity and unqualified submission to the imperatives of the corporate system. Complicit in the first formal expression of Mondaleism are those who early and often endorsed Mondale without reservation: leaders of the National Organization for Women, organized teachers, democratic socialists, black officeholders, labor hierarchs, Hispanic leaders. They must now be foot soldiers in a campaign whose captains are implacably antagonistic to the principles and concerns of their constituencies. What can Mondale’s tame left flank do, for instance, to rescue poor women, blacks, service workers and the young and old from the ranks of the growing underclass impoverished by economic policies and structures Mondale endorses? How can socialist leaders save socialist politics from the isolation, irrelevance and ultimate extinction or to Democratic Party practices? How can union chieftains get more power for union members when the point of Mondaleism is the expansion of management control? How can black politicians win from Mondale what they have been denied by the party machinery for years on end? Where does the left–the white left, that is, which refuses to concede Jackson’s validity and hardly acknowledges his existence–stand now? It has given up on class struggle, black liberation, the Third World, even détente. It can hardly remember the nuclear freeze. Its only live demand, settled last week, was the promotion of a woman as the Democratic Vice Presidential nominee: the transubstantiation of politics into symbolism. If she does anything, Geraldine Ferraro will activate the party ticket, but is poorly placed and notoriously disinclined to shift its gravity from dead center. She was, after all, chair of the platform committee which ratified the party’s present conservative cast. Those who rejoice at her appointment should remember as well the politics her appointment is being used to ratify. To what degree, therefore, will symbol become sedative? Is this bleak prospectus the inevitable consequence of what Michael Harrington recently extolled as the necessary strategy for any left in America today: that “the Democratic Party, with all its flaws, must be our main political arena”? Harrington, co-chair of the Democratic Socialists of America, and Irving Howe, editor of Dissent and avatar of democraticsocialism as an unhyphenated ideology, chatted at great length recently in The New York Times Magazine, which touted them as “Voices From the Left.” The import of their conversation, which ran 8,000 words without one mention of the difficult name Jackson, was the denial of any vital role for the left in current politics. They are wrong. There is a way to salvage something of the left’s presence even this late in the year, to broaden its constituency and sphere of action, to begin building a role for the next decade-and still engage the realities of the two-party system. But the left must first accept the invitation of history. Heedless of the seismic convulsions in the American economic and social landscape during the last two decades, the left continues to read old history, the chronicles of the New Deal and its successor deals in the postwar boom. In that long time, the Democratic coalition offered industrial workers, the new urban and suburban middle class and white ethnic minorities (overlapping categories, to be sure) a certain measure of economic security, social mobility and political influence in return for their cooperation in the governing strategies of state and business in the American Century. The bargain gave labor wage security in exchange for docile acceptance of management supremacy in all significant economic decisions. The bargain began to unravel in the early 1960s, when the underclass mutinied. The Democratic response was the War on Poverty, a kind of Federal trust fund for the civil rights revolution. But the war was lost. A few statistics illustrate the size of the rout. In 1965, the poorest 40 percent of the population earned 11 percent of the total US market income; nearly a decade and a half later, that same group’s share had shrunk to 8.5 percent. From 1945 to 1983, black male participation in the labor force fell from 80 percent to 60 percent. The poor got poorer and the blacks got unemployed. fundamentally failed in its ultimate goals of achieving the mass incorporation of black labor into the high-wage economy, or of surmounting the barriers of de facto segregation in Northern schools and suburbs. A generation after the first March on Washington for Jobs and Freedom, black unemployment remains double that of whites, while black poverty is three times more common. Sixty percent of employed black males (and 50 percent of Hispanics) are concentrated in the spectrum of the lowest-paid jobs. The number of working women doubled between the Eisenhower and Reagan Administrations, though in the same period their earnings declined to 59 percent of the average wage for men. In 1980, one-third of all full-time women workers earned less than $7,000 a year, as against a white male median of $17,000. A populist, progressive Democratic Party could have entered the 1970s with a renegotiated social compact, an expanded coalition and a renewed vision. It could have proposed to bring women and blacks into better-paying jobs; to reform tax and spending policies to expand public services and collective consumption; to apply Keynesian theories to a peace-building rather than a war-making economy; to answer increasing demands for better health care, education, recreation and a clean environment. And, indeed, there was a ready-made activist base and an eager constituency for change in the civil rights, black liberation, women’s and peace movements of that period. It was the road not taken. The Democratic Party leaders and their allies–Hubert Humphrey, Henry Jackson, George Meany–were unprepared to accept the necessary conditions for the directional shift. They could not imagine converting to a peace economy when the war economy (and the ideology that rationalized its expansion) had been the foundation of Democratic fortunes since 1939. Labor leaders could not countenance the threat to their power implicit in the demands a militant and unified work force would make for integration, participation in management decisions and conversion. And finally, the party bosses would not allow a broad alliance of disenfranchised blacks, poor people, women and low-wage workers to challenge their hold on the party and its agenda. In short, the Democrats would not accept a transformation of their party. The party traditionalists counterattacked. Labor leaders forced blacks out of training programs, bucked affirmative action and literally assaulted those who protested the war system. In 1972, Democratic hierarchs and their labor lieutenants decided to defect–from the campaign of their party’s candidate–standard-bearer of the popular alliance at its strongest hour–rather than permit a new politics to develop. On that scorched earth was built the political architecture of the next period. With its crumbling coalition and its old commanders, the Democratic Party now faces an entirely changed landscape. The road the country did take as the postwar boom ended led to the famous split-level economy, with its vast low-wage ghetto (containing a third of the labor force), its newly employed and scandalously underpaid female component and its powerful echelons of the new rich. Consider the expanding service economy and its fastest growing sectors. § Health: A half-million highly paid doctors and dentists sit atop a slag heap of 3 million clerical and blue-collar medical workers, the largest single segment of low-wage labor in the United States. § Business services, particularly banking and real estate: High-priced lawyers set their meters at $250 an hour, while legions of bank tellers, secretaries and clerks sitting next to them are lucky to make $5 in the same amount of time. § Fast food: At the apex of the arches are the franchise burgermeisters, and at the bottom the young, black and now old counter jockeys, whose average wage is below that of farm laborers. To sustain and expand their privilege, the new rich have mounted one of the most successful campaigns in American political and economic history. From the tax revolts of California to the tax programs of the Republican Administration and the Democratic Ways and Means Committee, the large upper class has devised schemes to make a better living for itself at the expense of the even larger underclass. Despite spasms of opposition to one or another policy or piece of legislation in the assault, the Democrats are incapable of challenging the basic corporate campaign. For it is an attack in which those who beat back the new politics in 1972 have a large stake. They cannot meet the enemy; they are it. The Democratic weakness is much more structural than spiritual. For instance, the present phase of military expansion, from 1977 to (at least) 1986, is the longest in US history. Amid long-term stagnation, it is the engine of what vigor remains in the economy. To cut back on such spending in any substantial way would be to assail steel, machine tools, aerospace, shipbuilding–all of which are, in labor terms alone, core parts of the Mondale coalition. Mondale could no more allow antimilitarist sentiment to threaten the war industry than he could let insurgency threaten Third World regimes in hock to the American banking system. Mondale pretends to include members of the newly expanded underclass in his old coalition, but the programs he espouses leave no place for them except as voters on election day. Gary Hart could have undercut Mondale by embracing the popular alliance that the old Democrats ignored. Instead, he chose to clothe his neoliberalism–the politics of lowered expectations–in bogus generational rhetoric. In the end, his only issue was the difference between Mondale’s birthdate and his own, whatever that may be. So, in control are the Democratic “pragmatists,” as the pollsters and pundits call them, the ones who argue for party unity at the expense of movement and who propose that the way to beat Reaganism is to denounce its excesses while accepting its premises. The pathos of their opportunism lies in its shortsightedness. As every tactician attests, the key to defeating Reagan is turnout. But turnout has political content and context. People will not simply vote for Anybody But Reagan; they want somebody who speaks to their interests, who promises them more than they’ve got and who offers them hope. The enormous nonvoting constituency of today is located in the lower precincts of the split-level economy. Its participation in the election is by no means assured. But it is there that the left must look for its opportunities and discharge its responsibilities in the next period. The only way the left can work within the Democratic Party is to act without it. That is, the future of the party will be determined by the development of forces operating on its margins or beyond its boundaries (just as the developing American political economy- “late capitalism” faces its most serious challenge at the hands of the Third World, both within and outside the national frontier). The constituency that formed in response to Jackson’s campaign is a prime example. Its votes are absolutely necessary to defeat Reagan, but its priorities set it directly against the power and position of the Democratic mainstream. The pragmatists who want the votes will soon see that those votes don’t come free and that without a significant reordering of the Democratic agenda, the new voters will not stream to the polls. The same holds true for the constituency of women voters which, like Jackson’s somewhat attenuated Rainbow, poses a major obstacle to Reagan’s re-election. As Barbara Ehrenreich pointed out in a recent article in In These Times: “[The] gender gap has more to do with the proletarianization of women than it does with feminist ideology. It is poor women, and most strikingly, poor, single, working women, who account for much of the aggregate gap.” Ehrenreich makes the essential point that it is economic issues and not traditional feminist issues like the Equal Rights Amendment and abortion that account for the gender gap. To address the concerns and accommodate the needs of the female proletarians, a political party and the political economy itself would have to undergo change considerably greater than the existential frisson engendered by the nomination of a woman as Vice President. Because NOW asked only for that gift, there is no reason for Mondale to move toward the changes that could materially improve the lives of the mass of women whose votes he expects. The left has a history of attachment to a political logic that admits two equally unacceptable alternatives: isolation in purist parties (activists and intellectuals doomed to life on the margins of social practice) or total immersion in the belly of the Democratic beast. Once the left sees that party as the only possible vehicle, it is trapped in the lesser-of-two evils paradox and ends up as a cheering section for the most reactionary elements in it. To see a way around the paradox, and escape the logic, the left need look no further than the Jackson campaign’s project to form a popular coalition of people who need change most and can be counted on to fight for it hardest. Rainbowism is certainly the most interesting news in this political season, and potentially the most wrenching historical development since the labor struggles of the 1930s. It offers an example of how an alliance of the disenfranchised can approach the Democratic Party, use it when necessary and work at some remove when that seems propitious. Symbolic of that complex relationship, Jackson’s trips to Syria, Cuba and Nicaragua stand out in high relief against the kind of foreign policy pronouncements other candidates have made. Jackson posed himself squarely against the cold war policies and imperial attitudes that the Democrats have maintained for years. To take a domestic example of the achievements of Rainbowism, Lloyd Doggett would not now be facing Phil Gramm in a momentous Senate race in Texas had it not been for the efforts of the Jackson coalition in the primary campaigns in that state. But there are other opportunities as well. An election campaign, it should be stressed, is only one avenue of action in the process of empowerment. The methods developed by Ralph Nader, which organize coalitions of consumers at the point of consumption, aggrieved citizens at the point of their grievance and workers in the context of their workplace, make enormous sense for leftist activism. Parties are important but they are not all-important. The Democratic Party is a vehicle, not the only vehicle. It can be used for its power and commanding position in the society. The first test for the left is upon us. The Democratic National Convention is in large part prepackaged in the rules, methods of delegate selection, platform resolutions and kindred politics of the primary season. But the Jackson delegation, together with wild cards in other candidates’ hands, can still insure that radical demands about race, economics, militarism and gender are heard in San Francisco. They can do that in the Moscone Center, perhaps, but more imaginatively in anterooms and hotel suites. As the fall campaign begins, the left should remember that there’s more to politics than is suggested by that self-deprecating formulation of Realpolitik: hold one’s nose and vote for Mondale. Barbarism with a human face is still preferable to barbarism with a barbaric one, but there are hundreds of other campaigns, scores of local coalitions in formation and numerous activist projects which carry greater weight in an electoral year. Voting for Mondale, the old in-out on November 6, does not necessitate giving up on all those activities. The Democratic call for unity is a guilt trip when party whips-the ones in the press as well as in power–use it to extinguish all signs of life on the left side of the universe. It is not the left’s business to shore up the party and cheer on its candidate every four years. There is a bigger job to do in creating radical alternatives to dead-center politics-and that means regarding the Democratic Party without sentiment or illusion.